Consadole is was born at 1996. The predecessor of Consadole is TOSHIBA FOOTBALL CLUB (amature, company team) in Japan Football League (JFL). In 1996, Toshiba FC, which wished to change to pro-team from ama-team in those days, moved to Sapporo City from Kawasaki City (in Kanagawa Prefecture), and become a new proffesional club team, “Consadole Sapporo”. In 1996, 1997, Consadole belong to JFL(Japan Football League; then Secondary Football league in Japan). 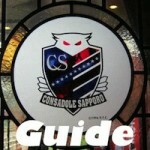 In 1997, Consadole was the Champion of the league, and was promoted to a higher league (J-League). From 1998, Consadole plays games in J-League. In 2016, “Consadole Sapporo” changed the name to “Hokkaido Consadole Sapporo”. Sapporo is hometown’s name, Hokkaido is home prefecture’s name. The club added the prefecture’s name. 1996-1998: J-League(Japan Professional Football League) was top league. Japan Football League(JFL), which had pro-clubs and amateur-clubs, was secondary league. 1999-2013: In 1999, J-League was separated two leagues. Division 1 (J1) is top league, and Division 2 (J2) is secondary league. Then, Japan Football League(JFL) is third league. 2014-: J-League was separated three leagues. Division 1 (J1) is top league, Division 2 (J2) is secondary league, and Division 3 (J3) is third league. Then, Japan Football League (JFL) is forth league.